After causing a meltdown in British tabloids over the “hallucinating effect” it might cause, Russia’s Filin visual optical interference device, fitted to some Navy ships, has been captured in action by the Russian defense channel. The first-ever public footage of Filin 5P-42 in use was broadcast on the Russian Defense Ministry’s channel Zvezda, which filmed them being tested in St. Petersburg. The undated trial was held at twilight in the Gulf of Finland. Filin – which translates as ‘eagle-owl’ – is a powerful light gun that makes it impossible to take aim at, or even to look in the direction of, any hardware that it is protecting, be it a Navy vessel or a land-based vehicle. 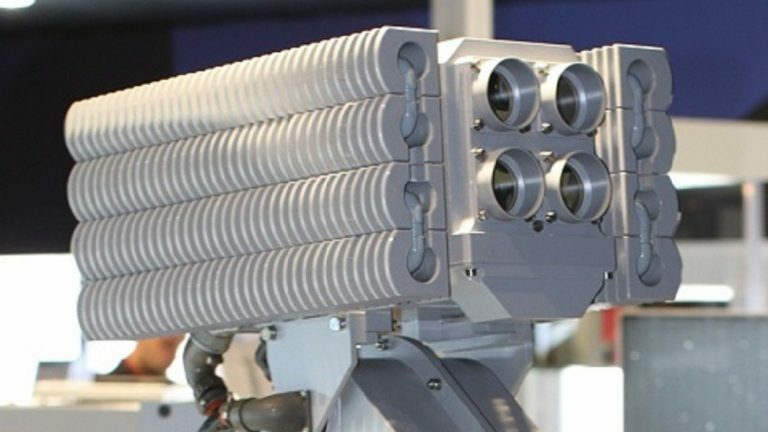 The optical interference system is capable of neutralizing scopes, laser position finders and the aiming systems of guided missiles, and of blinding enemy personnel at a distance of up to five kilometers. It works at night and in twilight, but the Russian manufacturer Roselectronica is currently working on a device that will be as effective during daytime as well. Filin is already installed on two brand new Russian Navy frigates. One of them, Admiral Gorshkov, sailed through the English Channel on Saturday after bad weather forced it to make a stop-off at the Scottish coast earlier this week. During this time, it was shadowed by Royal Navy ships and became the focus of scaremongering publications in the British media. Many of those, who witnessed the device in action, have indeed said that they saw “a light patch constantly drifting before their eyes, causing almost hallucinating effect. Most spoke about dizziness, nausea and disorientation,” Vladimir Zharov, a department head at the Ruselectronics plant, told Zvezda. But while UK reports, which used the same quote, were scaring readers about hallucination- and vomit-inducing Russian ships sailing off British shores, they forgot to mention that Filin has been developed for defense purposes and, even if it looks as bright as the sun, does not cause irreversible damage to eyesight.